J: Let me just say, the Island Chefs’ Collaborative 3rd Annual Food Festival has shown me how many more great people I have yet to meet. It was a beautiful sight to see caterers, farmers, restaurateurs and chefs all working towards one goal. That is the promotion of local food. What I observed today was a drop of water from a very large pond. I hope over time we can bring these people to your attention. E: And stuff our faces! Defending our Backyard was like storming the barn doors, and going to see what the higher class restaurants offer without having to go there. I wouldn’t say it’s cheaper, but it’s a way to sample what each place could do before deciding to boldly go where no hungry man has gone before. J: Or in our case, two very plump hungry men. I almost skipped dinner from the amount of food I ate. E: I had a quick breakfast before arriving, and what do I do? Follow the brick oven scented trail to the pizza tent. That was the only fast food there at the festival, and all the other places offered gourmet treats. There was plenty of wine tasting all around, but for the beer enthusiast, it’s easy to get a pint or two down before leaving the grounds. Thankfully, I didn’t drive. J: I would say the wine and beer was in more abundance than the food. A number of the vendors underestimated the amount of people and shut down early once supplies had run out. My big complaint was the small number of farmers. I expected more but the upside to all of this was the quality of the product offered by the farmers who were in attendance. E: Agreed. I was hoping for more farm fresh products to find. I was after wild mushroom and managed to snag half a pound of morals to sample. I wanted to Shop the Wild. 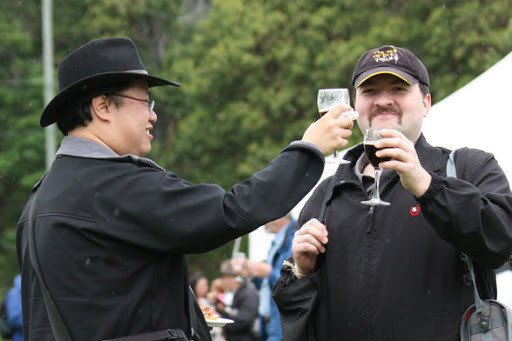 I went to that event last year up at Royal Roads and was amazed at the amount of wild food products offered. At this show, hosted on the Fort Rodd Hill grounds, there were farm grown products to chase down than food harvested from the wilds of BC. Some farmers do have nearby forests in their backyards, and that’s very true in BC. Just not in Alberta. J: I don’t have a forest in my backyard but I do have a nice lawn with a few trees and some pesky raccoons. I did manage to grab some of those mushrooms too, but not as many as you bought. I guess this means I have less morals than you. But I was happy. I made a number of connections, saw a few attractive women and spent time with some good alcohol, food and friends. And you were there too Ed. E: Says the guy who was embarrassed to ask for a phone number, eh James? I have a huge mountain near me and more to talk about in part two of our visit to Defending our Backyard. There were many tents, and each one had at least two different vendors or restaurants showing off the best of what they could do. There were a lot of tasty, tiny, treats which we’ll reveal in part two. This entry was posted in Annual Events, Events, Reviews, Your Island Guide. Bookmark the permalink. dammmmmn Ed, you should have told me you were going to this. I would have tagged along like a mahfucka.Let me know if you guys are ever out somewhere where I haven't tried a burger yet (Glendale Gardens trip perhaps? ).